Found Art Friday & Balance Found! "Finding My Balance" 7x7 inch print on velvet fine art paper now available here at ETSY. "Gotham City" work in progress by Veronica (who has my favorite name). She was playing with shapes and cut-outs when this cityscape emerged. 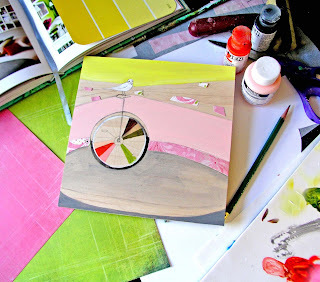 She talks more about the process on her brand new blog today! "Finding my Balance" a work in progress. 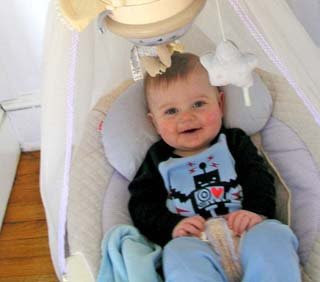 Little Nicky awakening from his nap today. 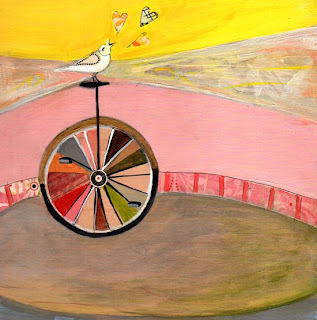 Isn't being an artist and a mom always a balancing act? Or being an artist and something else. Or being a mom and ... taking a shower. Today I was able to work on my new painting for an hour and 1/2 of bliss while the babies slept. I haven't really been able to do much work while Christophe has been in France, but today I decided to run for the studio and paint whatever inspired me. (I'm saving my first tiny portrait commission for when I have more uninterrupted time.) Once again proving that art can be a window onto the subconscious, I painted something to do with finding balance. Hopefully, I will be sharing the finished painting with you soon! Happy Monday, everyone! I've been holding back on selling my original paintings because I plan to offer them for sale all at once very shortly. In the meantime, I've been working on my email list to let my friends and blog readers know right away when they are available. 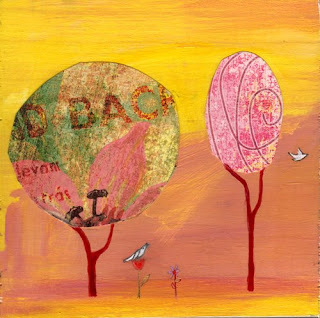 They will be sold from my website at http://www.cathynichols.com/ rather than through my ETSY store. And, of course, I will announce the sale on my blog, so stay tuned! Oh, and I will be offering a coupon in my upcoming email, so subscribe if you are interested. 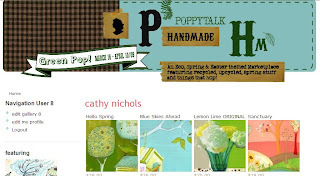 And I've been meaning to mention that I currently have a 'table' at the Poppytalk Handmade Marketplace this month for their "Green Pop" market. Come visit me there and check out the other wonderful artists! I hope that everyone had a lovely weekend. My baby Nicolas has been sick, so I've been sleepless, but I'm hanging in there! I can't believe it's Friday already. Christophe has been in France, and the days have just flown by. I am currently on semi-vacation' because my mom is visiting from California for the weekend, but I wouldn't dream of letting down my "Found Art Friday friends." 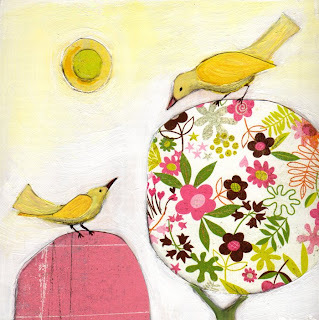 "Breakfast in the Garden" by Marisa Haedike of Creative Thursday. This is a beautiful sight Marisa "found" while breakfasting in her sunny California garden one morning. In the spirit of synchronicity, the image for Marisa's current podcast -- entitled "Trust" -- is also from this same morning garden series! "Lady of the Lake" by Leah Piken Kolidas of Creative Every Day. In this piece Leah was painting intuitively over a collage and the face of the woman just seemed to appear, as did the feather tattoo on her arm! 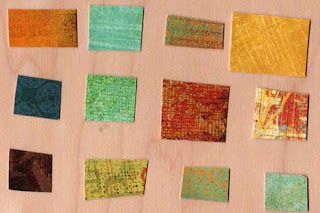 Leah also has some beautiful thoughts about found art in her post "Creative Muses, Magic and Synchronicities." "when peacock blue meets a dollop of spring pink" By Gina Lee Kim. 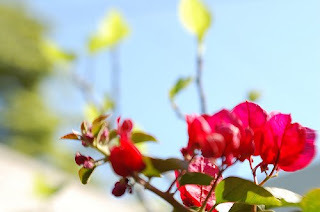 I love what Gina has written about this piece on her blog! Gorgeous colors, Gina! "Carnation" by Alicia Hurst. Alicia found this beautiful flower when she was browsing through the flower market. She says that she usually goes there to photograph flowers but on that day she wasn't looking. The carnation found her so she bought it & brought it home. Have a beautiful Friday and happy weekend everyone!! Hope you find art & beauty today in your world. 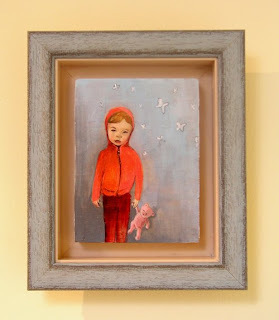 "Annabelle and Pink Bear Dream of Butterflies" custom framed. We just received my painting of Annabelle back from the frame shop, and my daughter is so happy. She keeps pointing at it saying "Annabelle" and "That's My Bear." Her response has pushed me over the edge. I am now officially open for tiny commissioned portraits other people's babies, children and loved ones. The portraits will be approximately 4x5 inches and $150. I've done lots of portraits in the past, but my intention for these tiny ones is that they convey not just a likeness of the subject, but something of their inner world as well -- like Annabelle & her butterfly dreams. Please contact me or leave a comment if you would like to commission a tiny portrait (or ask questions). A bunny for my little bunny. "Among the Flowers" by Emma Talbot of Little Brown Rabbit. Speaking of little ones, I was one of the lucky winner's of Emma's giveaway last week!! 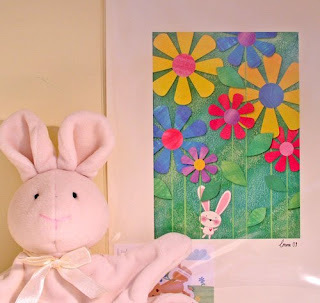 I received this adorable bunny print yesterday just in time for Easter. Can't wait to put this one up on the wall. 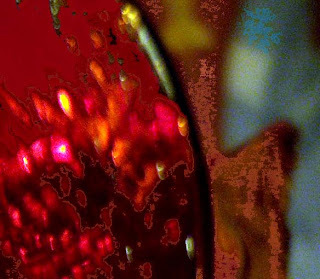 And one final note: Found Art Friday will now be an ongoing event here on my blog. I had such a terrific response to last week's posts that I have decided to continue taking submissions of my readers' found art projects. 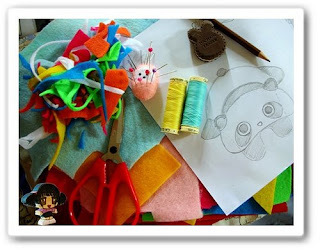 As I did last week, I will feature your found art with a link to your blog. It's a great way to share our creativity, get to know one another and have FUN. Submissions are due every Thursday. Hope you can participate! "The World at Our Feet" 8x8 inch mixed media on wood (commission -- not for sale, but prints will soon be available on ETSY). 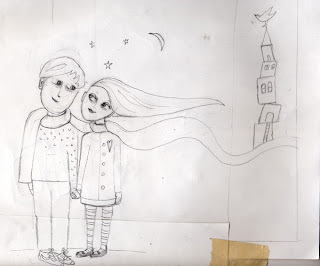 Initial sketch for the couple in "The World at Our Feet." In the midst of this fun, I did manage to complete the above commission for the sweetest woman -- a true romantic. I thought of the title after speaking with her about love over the phone. Of course, I'm not quite sure if it's finished. This time I'm still endlessly tweaking the sky. 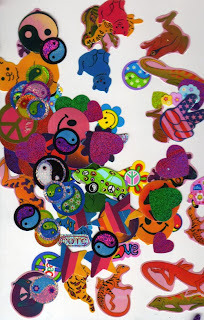 One final note -- a HUGE thank you to the sweet readers who shared their "found art" on Friday. It's always a risk to share your spontaneous creative moments with others, but it's also wonderful when you can just let your guard down in a supportive environment. So thank you also, for those who left comments. And for anyone who is still wondering... Christophe's 'mystery dessert' was JELLO! Big hugs to you tonight! "Panda Doodle" photo by Jacqueline. I love the way that this photo captures not only Jacqueline's doodle (which she did in her PJs), but all the wonderful colors and tools of her great imagination! 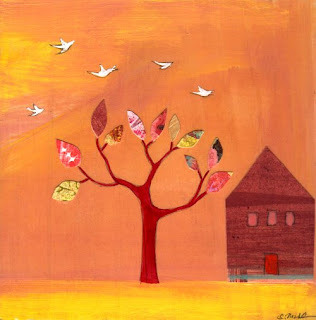 "Dream of a Black-Capped Chickadee" by Gina Kim. Painted over breakfast where Gina has paintbrushes ready at all times. So pretty! 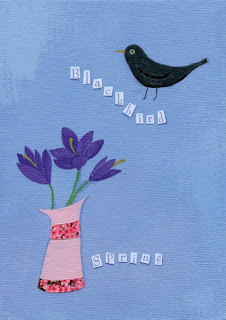 "Blackbird Spring" by Emma. Emma's lovely piece began with a blue background, then sprouted crocuses after she saw some growing in her garden as she waited for the color to dry. Then a blackbird flew in from memory. As a final touch she added the cut out words to finish the composition. 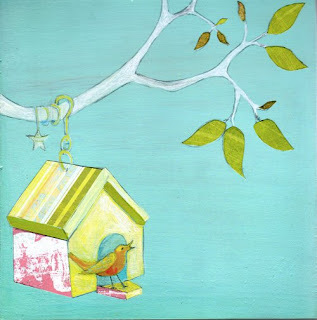 You can see this painting in process on Emma's blog, Little Brown Rabbit. Just one little tidbit that I want to share about these 4 pieces. If you look at them horizontally, they all have a very similar composition. Even Jacqueline's photo seems to have a black object that looks like a blackbird in the right upper corner. Maybe we were all experiencing a little synchronicity here! I want to thank all of the artists who participated in Found Art Friday. Not only did I have a great time seeing your submissions, but I love that it helps my blog readers get to know one another, too! And it's just plain fun -- especially on Friday the 13th. Wishing you all a day of serendipity and synchronicity. "Coming Home (2)" print now available here on ETSY. "Coming Home (1)" print now available here on ETSY. Just finished the piece today, and I am so happy with the colors. It also has a "found art" bit of serendipity within it, too, because after I decided on the title "Coming Home," I noticed that the word "BACK" is written across the paper in one of the trees. So fun. Speaking of fun, I am so excited to post the found art submissions I've received! I've decided to post them on Friday but make the submitting deadline Thursday night just to give myself enouch time to organize things. So there's more time left for you creative folks out there! "On Top of the World" print now available here at my ETSY store. 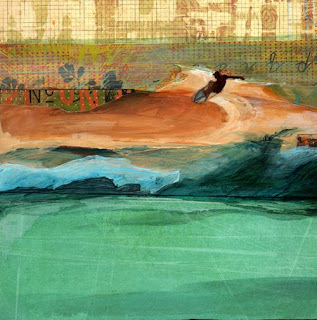 This is my newest mixed media surfing piece. I really like the colors and addition of the lettered background paper because it has that sort of grunge surfer feeling that makes me think of Venice (which I miss). Hope you like it!! And I want to say a special thank you to so many nice bloggers out there who blogged about my work yesterday. Something must have been in the air. Thank you to Jess Gonacha (who's art I LOVE), The Bunny Cage, and Blue Satin Sashes. I appreciate you all tremendously! Speaking of appreciation, please don't be shy about sending in a pic of your "found art" project by this coming Thursday. It can be a drawing, photo, art piece or anything you'd like. I will post the image with a link to your site. I already have a few submissions but welcome more! Have a happy Tuesday! I'm giving away a print of "Hello Friend" at the charming site, iLash Girls. To enter the drawing, just leave a comment on their site by midnight Thursday, March 12th. And, as a special bonus, the winner also recieves a beautiful piece of jewlery called a "True Friend Pendant" -- looks like a great combo for a friend's birthday. Enjoy! Oh, it has been such a busy, sun-filled weekend here in New York that I hardly had time to work. I took the children to the park, went jogging and even tried out the new baby backpack carrier with Nicolas (mixed results here -- kind of a challenge when grocery shopping). But between these outings, I also managed to join Twitter (oh help, now I really have no life) and come up with a new color scheme for my 3rd surfing painting. I'm so excited to get started. These are for a new surf shop opening up this summer and the "patron" is a lovely woman who purchased my two original surfing pieces at the Nahcotta Gallery's Enormous Tiny Art Show. 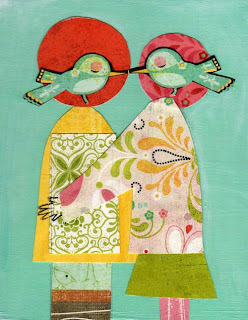 "Birds of a Feather" by Marisa Haedike of Creative Thursday. Well... 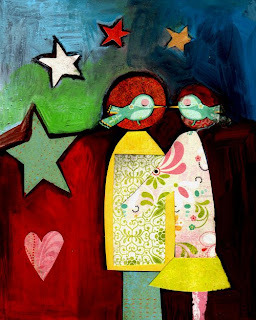 I just can't believe it, but my good friend Marisa of Creative Thursdsay posted a painting called "Birds of a Feather" today on her blog and in her ETSY shop. This amazes me because mine really just painted itself -- and title seemed perfect for the subject matter. Maybe we really DO tap into the collective unconscious when we create art in this manner. Hmmm.... what could this all mean? "Birds of a Feather" 8x10 print on 8.5x11 inch velvet fine art paper. Available here on ETSY. Yesterday I was frustrated. I was sitting in my studio trying to figure out what to paint for the day when I just gave up and adhered a red circle to my wood canvas. Then I stuck on a pink one next to it. Then I looked down and saw these birds kissing in a pattern in some paper and cut them out. The rest of the painting just evolved! It was a very interesting experiment, I think, in just letting go and CREATING! Sometimes it's fun to just to do an exercise in "found art." And I bet it would be really fun with kids. 7x7 inch image on 8.5x11 inch velvet fine art paper. Available here on ETSY. What a snowy day we had yesterday on the east coast. I think there must be about a foot of snow out there covering our home. And I'm happy to say that our little birdfeeder was very, very popular during the blizzard -- both as a source of food and shelter for the little birdies. 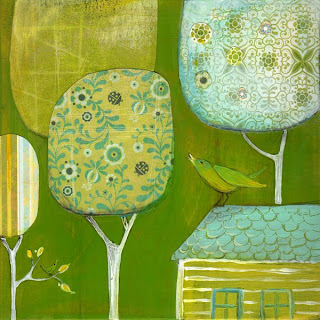 Looking out my window, I was inpsired to create this second homage to spring! I think a lot of other people must have been in a similar frame of mind because my "hello spring" painting was featured 2x today on the front page of ETSY! We are all just sick of winter. 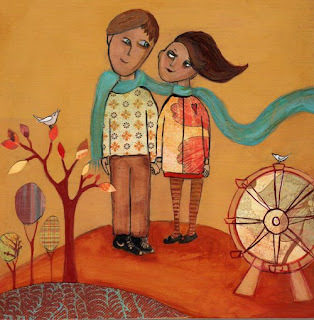 And I'd like to thank a few nice bloggers out there for some extra blog love on this piece today, too: Gordana from G(art)en and Alex at PaperFunkPress. Thank you!! 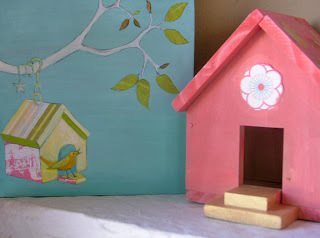 Additional inspiration for "Blue Skies Ahead" was this beautiful pink birdhouse hand-built and decorated by my 6-year-old stepdaughter, Axelle. I should have shot the back, too, because she painted it white with a pastel rainbow! She is so talented. 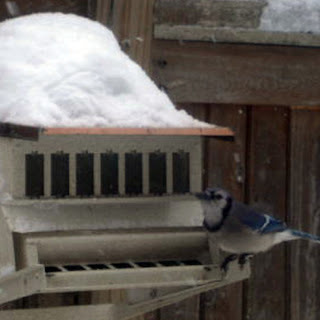 A happy bluejay weathering the storm on our birdfeeder. Bluejays, by the way, are HUGE. I had never noticed this before, but it became abundantly clear when I saw this guy next to the cardinals and sparrows that also frequented our little house. "Hello Spring" 7x7 inch print. Click here to purchase. Oh, don't we wish it was Spring already!! We had a little tear in the veil of winter this Friday, but it was sewn up over the weekend by some cold northern wind and a sprinkle of flurries. Brrrrrr. Apparently more snow is expected here in New York again tomorrow. I am going to stay inside and contemplate warmer weather. I guess it was a day all around for creating because Annabelle was very busy herself today with what I think is an amazing little collage for a two-year-old.